Shares in newly formed insurance group HHG opened well above their issue price when they debuted on the London Stock Exchange today. The company, which has been spun out of Australian financial group AMP, owns UK household names including Pearl, NPI and London Life. It was formed after AMP announced in May that it was pulling out of its struggling UK operations. The units that now compose HHG had been hit by the weak stock market. HHG's shares, which were issued at 30 pence in the UK, debuted at 37.5p. Its other listing on the Sydney Stock Exchange opened 24% above its issue price of 74 cents, at 89 cents. HHG's chief executive Roger Yates said the UK issue had attracted a "significant" level of support from both existing shareholders and new investors. It is understood to have been several times oversubscribed. AMP is not subscribing for shares in the HHG offer and will remain ownership of around 11% of the company. The separate floatation of HHG brings to an end AMP's disastrous foray into the UK insurance market. With weak stock markets and poor trading conditions, its UK assets such as Pearl, NPI and London Life struggled greatly, haemorrhaging cash and hitting AMP's bottom line. After numerous failed restructuring exercises and capital injections, AMP decided to cut its losses last May and withdraw from Britain. In August, the parent company reported one of the largest losses in Australian corporate history - 2.16bn Australian dollars (US$1.4bn; £880m) - for the first six months of 2003. 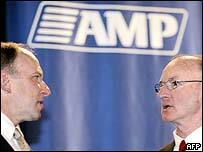 For the same period in 2002 AMP made A$303m. In December AMP got 97% shareholder approval to demerge its UK operations into a separate company HHG, which it valued at £1.3bn. AMP has itself faced talk of a takeover from National Australia Bank (NAB), which bought a strategic stake in the business back in August.